The town of Granville, situated in the northeastern part of Addison County, is bounded on the north by the town of Warren and a part of Roxbury; east by Braintree; south by Hancock, and west by Ripton and a small part of Lincoln. It was granted by Governor Thomas Chittenden on November 7, 1780 and chartered August 2, 1781. Many of the earliest citizens of Granville (or Kingston as it was originally known) came from neighboring towns in the late 1780s, attracted by an offer of one hundred acres to the first women and their families that would move to this Green Mountain town. 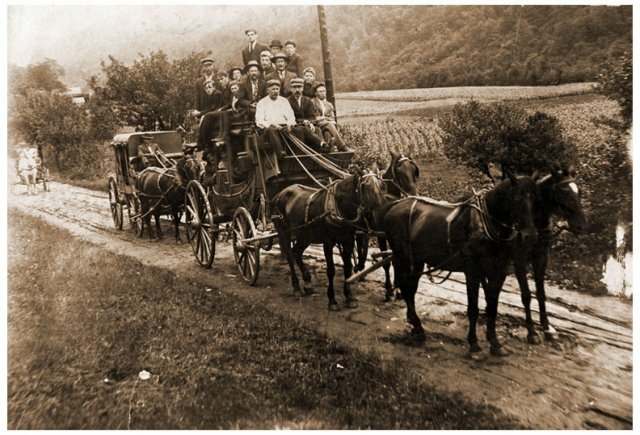 These settlers, undaunted by the rugged landscape, traveled north from Hancock along a road (now VT Route 100) following the White River and soon established their farms on the rocky slopes. The small villages of Granville (now Lower Granville) and Granville Centre (now Granville village) evolved around mills on the river rapids along the valley road. The hamlet of East Granville, cut off from the rest of the town by a mountain ridge, developed on the Vermont Central Railroad line after its construction in 1849. At one point in time there were ten school districts, each with its own schoolhouse. Population rose to a high of around 1,100 in the mid-1880s. Since then a steady decline has brought it to a low of about 200 in 1950 and a slow increase since then to a 2007 population of 287. Granville and Lower Granville are situated in a valley through which the White River flows. The hills on either side of the valley are heavily wooded and much of those on the west are part of the Green Mountain National Forest, which accounts for 46% of Granville’s total area. North of the village in the Granville Gulf, Moss Glen Falls cascades over vertical rocks, falling over 50 feet. Fewer than half of the roads of the 1880’s remain in use today. East Granville, located over a mountain range, was first chartered as the town of Sandusky. The name was later changed to East Granville and was accessible by a road over Braintree Mountain. A once bustling railroad siding and manufacturing district, East Granville has been reduced to a row of houses along Route 12A with no remaining businesses. Because the road over Braintree Mountain to East Granville is now a jeep trail, a trip of 30 miles is necessary to reach that town over the Roxbury Gap road from VT Route 100 in Granville. Town Clerk’s Office. Originally called the Methodist Episcopal Church, the name was changed to the Union Meeting House and today functions as the Granville Town Hall. By 1870 there were several lumber mills in Upper Granville Village and they all used water power from the White River and adjacent brooks. It was in this era that six row houses were built beside the main road to house the Granville Manufacturing Company mill workers. The mill produced wooden bowls and quarter-sawn clapboards. Five of these remain today as private residences. The original barn of the Granville Manufacturing Company mill burned down, as did the three successive buildings that replaced it. Three of the original ten schoolhouses remain today. Number 10 in Upper Granville Village functioned as a school until 1949, after which it was used as the town library. Schoolhouse Number 2 in South Hollow is now a private residence. Schoolhouse Number 1 in Lower Granville closed in 2009 after 158 years of continuous use. A Grange Hall was erected in 1875 and it still stands today. After the farmers of Granville formed a Grange Chapter in the Village, a small building was put up between the Union Meeting House and the school. That building became one of the first Grange stores where farmers took their produce to sell. This building also housed the Granville town hearse until 2007, when it was loaned to the Addison County Fair and Field Days to be included in their antique collection. The building was then dismantled. Granville’s original residents were homesteaders carving out places for sustenance on the hillsides. Where there was more arable land on the valley floor larger farms sprung up. Most of the local employment opportunities depended on the abundance of timber, which provided logs for export as well as for the mills producing shingles, clapboards, tool handles, chair stock, and later wooden bowls. Locals also worked in the three inns and two general stores. The ten schools each required a teacher and there were ministers, a town clerk, and several overseers. As in all rural towns there was a post office and a blacksmith shop. Cheese making and maple syrup production were usually undertaken by families. It is worth noting that around 1900, Benjamin Holt invented a crawler-tractor powered by steam and mounted on caterpillar tracks. It was named Diana, for a young woman who worked in the village. Diana the Log Hauler was used in winter to haul as many as six sleds of logs at a time from Austin Hollow and Stetson Hollow to the upper village. John Deere, inventor of the steel plow, lived at the home of Mary and William Lamb in South Hollow sometime after 1830. He married one of their daughters, Demarius. They lived in different towns in Addison County, eventually locating in Moline, Illinois. After the death of Demarius, John Deere returned to the Lamb home in 1866 and married another Lamb daughter, Lucinia. The wedding took place in the Union Meeting House in Lower Granville. The couple returned to Moline, where Deere died in 1886 at the age of 82.